Dundee Wargames Club - Bushido : Oh, Hello There! 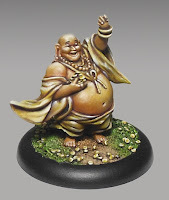 Welcome to the Dundee Wargames Club's Bushido Blog! This blog was put together for the purposes of following our Bushido group at the Dundee Wargames Club. Dundee Wargames is a Club based in Dundee, Scotland and operates on a weekly basis at Kage Nightclub, Dundee. For more information on the Dundee Wargames Club, please follow this link. Bushido is about to kick off here at Dundee Wargames as we take advantage of the latest deal through our Gaming Club Network Membership. We thought it would be ace to start our own blog that will take you from our first purchase, through to tournaments both home and away. We hope to use this blog to share our adventures in painting, collecting and playing Bushido, as well as giving our views and opinions on rules, miniatures and everything related to the world of Bushido!